Single cross hybrids - result from the cross between two true breeding organisms and produces an F1 generation called an F1 hybrid (F1 is short for Filial 1, meaning "first offspring"). The cross between two different homozygous lines produces an F1 hybrid that is heterozygous; having two alleles, one contributed by each parent and typically one is dominant and the other recessive. The F1 generation is also phenotypically homogeneous, producing offspring that are all similar to each other. Hybrids are often named by the portmanteau method, combining the names of the two parent species. 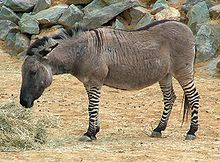 For example, a zeedonk is a cross between a zebra and a donkey. Since the traits of hybrid offspring often vary depending on which species was mother and which was father, it is traditional to use the father's species as the first half of the portmanteau. For example, a liger is a cross between a male lion and a female tiger, while a tiglon is a cross between a male tiger and a female lion. Sheep-goat hybrids, such as the Toast of Botswana. Hybrids between blacks and white rhinoceroses have been recognized. A fertile cross between a king snake and an corn snake. At Chester Zoo in the United Kingdom, a cross between an African elephant (male) and an Asian elephant (female). The male calf was named Motty. It died of intestinal infection after twelve days. Hybrids should not be confused with genetic chimeras such as that between sheep and goat known as the geep. Wider interspecific hybrids can be made via in vitro fertilization or somatic hybridization, however the resulting cells are not able to develop into a full organism. An example of interspecific hybrid cell lines is humster (hamster x human) cells. Hybrids are sometimes stronger than either parent variety, a phenomenon most common with plant hybrids, which when present is known as hybrid vigor (heterosis) or heterozygote advantage. Plant breeders make use of a number of techniques to produce hybrids, including line breeding and the formation of complex hybrids. An economically important example is hybrid maize (corn), which provides a considerable seed yield advantage over open pollinated varieties. Hybrid seed dominates the commercial maize seed market in the United States, Canada and many other major maize producing countries. Tangelo, a hybrid of a Mandarin orange and a pomelo which may have been developed in Asia about 3,500 years ago. Grapefruit, hybrid between a pomelo and the Jamaican sweet orange. Dianthus x allwoodii, is a hybrid between Dianthus caryophyllus Ã— Dianthus plumarius. This is an "interspecific hybrid" or hybrid between two species in the same genus. x Heucherella tiarelloides, or Heuchera sanguinea Ã— Tiarella cordifolia is an "intergeneric hybrid" a hybrid between two different genera. Hybridisation between two closely related species is actually a common occurrence in nature. Many hybrid zones are known where the ranges of two species meet, and hybrids are continually produced in great numbers. These hybrid zones are useful as biological model systems for studying the mechanisms of speciation (Hybrid speciation). Recently DNA analysis of a bear shot by a hunter in the North West Territories confirmed the existence of naturally-occurring and fertile grizzly'polar bear hybrids. There have been reports of similar supposed hybrids, but this is the first to be confirmed by DNA analysis. In 1943, Clara Helgason described a male bear shot by hunters during her childhood. It was large and off-white with hair all over its paws. The presence of hair on the bottom of the feet suggests it was a natural hybrid of Kodiak and Polar bear. In a hybrid, any trait that falls outside the range of parental variation is termed heterotic. Heterotic hybrids do have new traits, that is, they are not intermediate. Positive heterosis produces more robust hybrids, they might be stronger or bigger; while the term negative heterosis refers to weaker or smaller hybrids. Heterosis is common in both animal and plant hybrids. 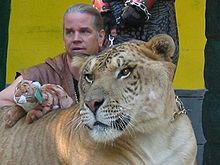 For example, hybrids between a lion and a tigress ("ligers") are much larger than either of the two progenitors, while a tigon (lioness Ã— tiger) is smaller. Also the hybrids between the Common Pheasant (Phasianus colchicus) and domestic fowl (Gallus gallus) are larger than either of their parents, as are those produced between the Common Pheasant and hen Golden Pheasant (Chrysolophus pictus). Spurs are absent in hybrids of the former type, although present in both parents. Regionally developed ecotypes can be threatened with extinction when new alleles or genes are introduced that alter that ecotype. This is sometimes called genetic mixing. Hybridization and introgression of new genetic material can lead to the replacement of local genotypes if the hybrids are more fit and have breeding advantages over the indigenous ecotype or species. These hybridization events can result from the introduction of non native genotypes by humans or through habitat modification, bringing previously isolated species into contact. Genetic mixing can be especially detrimental for rare species in isolated habitats, ultimately affecting the population to such a degree that none of the originally genetically distinct population remains. Ancient folktales often contain mythological creatures, sometimes these are described as hybrids (e.g., Hippogriff as the offspring of a griffin and a horse, and the Minotaur which is the offspring of Pasiphaï¿½« and a white bull. More often they are kind of chimera, i.e., a composite of the physical attributes of two or more kinds of animals, mythical beasts, and often humans, with no suggestion that they are the result of interbreeding, e.g., Harpies, mermaids, and centaurs. ^ H. A. Mooney and E. E. Cleland (2001) Hybridization and Introgression; Extinctions; from "The evolutionary impact of invasive species; Proc Natl Acad Sci U S A. 98(10): 5446'5451. doi: 10.1073/pnas.091093398.